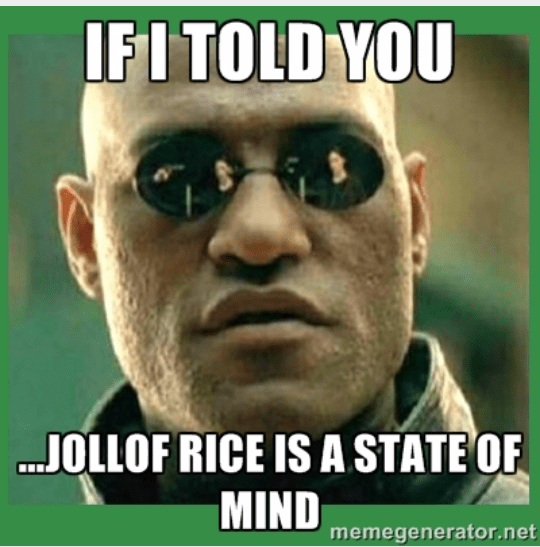 “So what if I told you that Jollof rice is a state of mind?” As a Nigerian, “Jollof” is our state of mind. 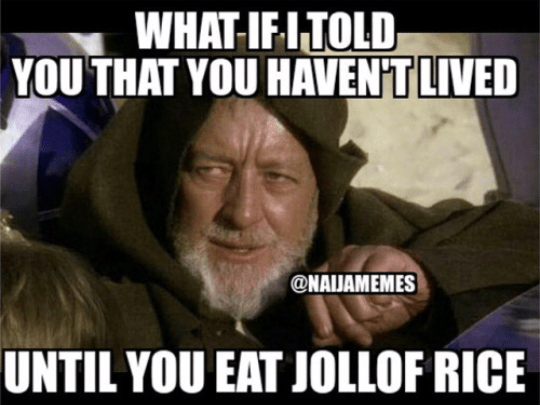 To a Nigerian, it means sweetness, happiness, joy And what if I told you that you havent’t lived until you have had Jollof rice? 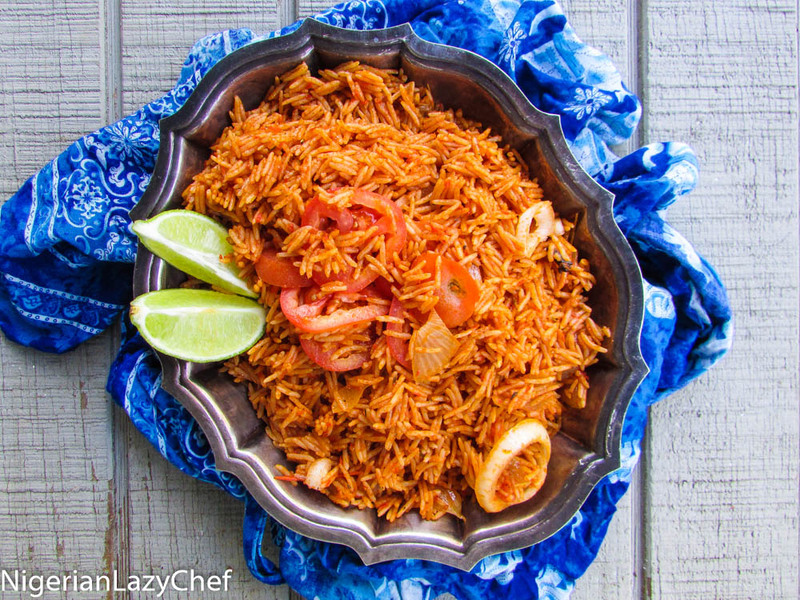 When I posted this recipe on Motherlandsfinest.com, my girl Freeds from My burnt orange said “it is the same as Ghanaian Jollof,” but I doubt that Ghanaian Jollof can taste this good…teehee! I prefer to use Basmati rice for my jollof needs because of the smell and the nutty taste of the rice. The makers of this rice knew exactly what they were doing when they decided to go into Basmati production. It’s like my ultimate favorite! 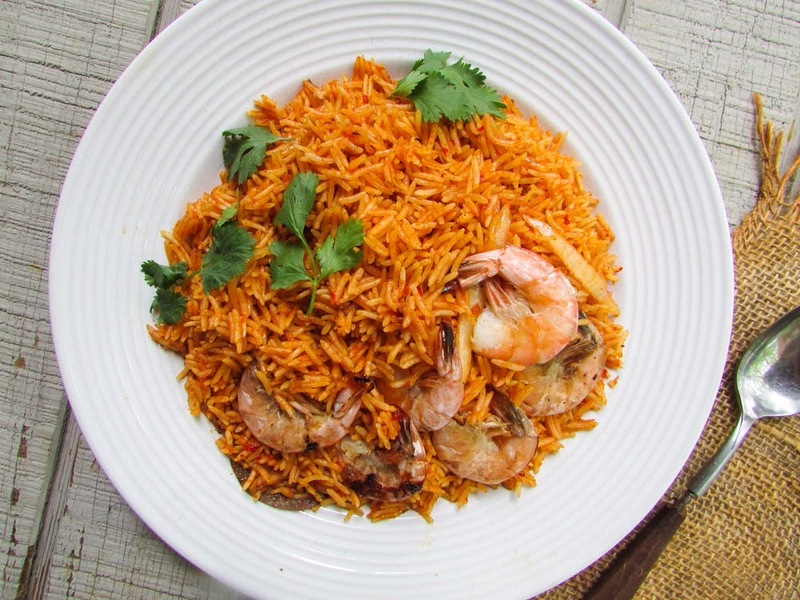 For this recipe, you could also go oiless, this type of rice is even much more better for my oiless jollof recipe. Lord Jesus, it’s delish! And just because I want you to have a jollof state of mind, the recipe is below. Enjoy! Bring some water to a boil. Pour it over the rice and stir to let the water touch each grain of rice; then drain. *Blend the peppers, tomatoes, 1onion and garlic. Pour the puree into a pot and steam until the water has dried up and you are left with a thick paste. *Heat the oil and butter then slice in the remaining half of the onion, sauté until translucent. Add the bay leaves, thyme, cloves and curry. Stir to release it’s flavor. Pour in the tomato paste and the boiled fresh tomatoes and peppers. Stir and fry until the mix looks a little dark and the oil has floated to the top. (the oil may seem a little much, please decant some of it to prevent a greasy rice). Pour in the drained rice and stir until each grain is coated with the fried tomato sauce. Pour in the meat stock to the same level as the rice and check for seasonings. Bring the pot to a boil. Cover with a grocery bag or foil wrapper and cover tightly; then reduce the heat and steam for about 10-15 minutes or until the water has dried out. Turn off the heat, stir in the garnishes and check for doneness. If the rice still has a little bite to it, (do not add water) cover with the bag and tight lid, so the heat in the pot will steam the rice. 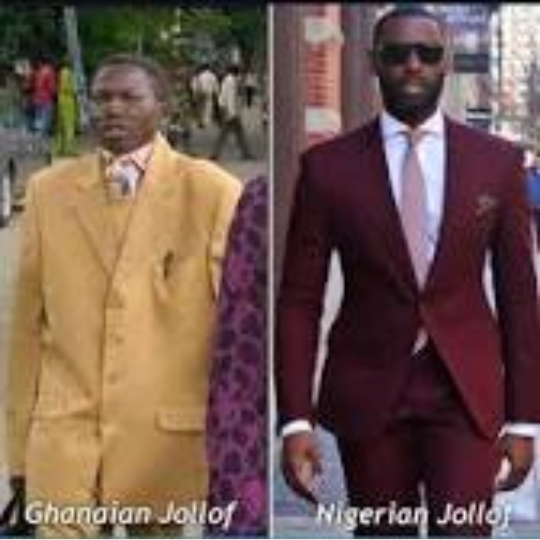 This entry was posted in Uncategorized and tagged basmati jollof rice recipe, basmati rice recipe, Jollof rice recipe, oiless jollof rice recipe, recipe for basmati jollof rice, smoked jollof rice recipe. Will try this out thanks! I have been following you on instagram for some time now. To say the least, you inspire me. I love cooking, but I am a lazy person. Thank you for taking food to another level.